Letter sent to New Democratic Party of Canada from the Canadian BDS Coalition. This follows the Socialist International the association of 140 global political parties, including 35 parties in government, adoption of BDS and call for a military embargo on Israel until it ends its violations of Palestinian rights. This is the most significant call for sanctions against Israel to date. Canadians ask where is the NDP–they no longer are part of Socialist International. The 2017 EKOS Poll showed 70% of Canadians support sanctions on Israel–this is the time for the NDP to align with the Canadian public as we moved toward 2019 election. The Socialist International is a world-wide organization of 140 social democratic parties. 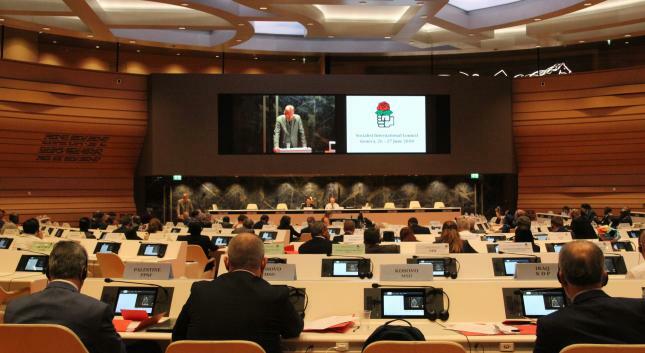 This stand by Socialist International is congratulated by the Canadian BDS Coalition and speaks to strength of the global BDS campaign to end Israeli apartheid imposed on the Palestinians. In this regard,Socialist International is moving justice for Palestine toward the South African moment when the world no longer accepted white racist apartheid in South Africa. The Canadian BDS Coalition urges the New Democratic Party to support the Socialist International call to action. We call on the Federal Council of the NDP to endorse the international BDS campaign and lead a public campaign to support this movement across Canada. We urge NDP Canada to stand with justice, equity and freedom, and with human rights and international law, by indicating its support for the Socialist International stance. We call on the NDP to support international and domestic law, and show leadership to end Canada’s complicity with illegal acts committed by Israel under the Fourth Geneva Convention. In this regard, we urge the NDP to call for a military embargo and economic sanctions until the Israeli blockade of Gaza is lifted, the occupation end, apartheid laws and systems dismantled and there is acknowledgement of the settler-colonial state’s actions. Gary Porter, Executive member, Saanich and the Gulf Islands NDP, British Columbia, Socialist Caucus candidate for Federal Treasurer at NDP Convention 2017. This entry was posted in News, Uncategorized and tagged BDS, Jagmeet Singh, NDP, New Democratic Party, sanctions, Socialist International, United Nations on July 13, 2018 by cbcjpi. This entry was posted in BDS Coalition Actions and tagged Gaza on May 18, 2018 by cbcjpi. What can I do? Economic Boycott. The Israeli economy is especially dependent on international trade and investment, making it especially susceptible to international economic boycotts. Campaigning has led to major companies selling up and leaving Israel altogether and a range of investors divesting from Israeli and international companies. The UN, the World Bank and other experts say that BDS is having an important economic impact on Israel. Experts report growing economic impact of BDS: According to the authors of a UN report, BDS was a key factor behind at 46% drop in foreign direct investment into Israel in 2014 compared to 2013. The World Bank partially attributed a 24% drop in Palestinian imports from Israel to boycott. Reports by the Israeli government and the Rand Corporation have predicted that BDS could cost the Israeli economy billions of dollars. Does the BDS movement call for a boycott of all Israeli products or just products and companies from illegal Israeli settlements? The BDS movement calls for a boycott of all Israeli products. However, some of our biggest campaigns are against companies that operate in illegal Israeli settlements in the Occupied West Bank. This is simply because targeting these companies are, at this stage, more capable of winning widespread support and succeeding. As our movement grows, so do our ambitions and the BDS movement is currently in the process of moving away from campaigns focused mainly on illegal Israeli settlements. A barcode starting with 729 usually indicates a product of Israel. But this is not always reliable. The best way to tell if a product is made in Israel is to look for a “Product of Israel” label or to ask the retailer if they can guarantee a product isn’t from Israel. For Palestinians, agriculture is much more than the production of olives, citrus fruit and other fresh produce, or keeping livestock. Farming is tied to the Palestinian people’s identity, history and resistance to Israel’s colonial occupation. Boycott based on information provided, and by looking for Country Code 729, Made in Israel and talking with the store manager/retailer. Promote alternate Palestinian products (if source). Fruit and vegetables are one of Israel’s biggest exports and all Israeli agricultural exporters are complicit in Israel’s violations of international law as they operate on stolen Palestinian land. As an example, approximately 60-70 products labelled “made in Israel” are available through the LCBO in Ontario. Many of these have connection with illegal occupation of Syrian Golan or Palestinian territory. See Canada Palestine Association re wine boycotts here. Sabra hummus is a joint venture between PepsiCo and the Strauss Group, an Israeli food company that provides financial support to the Israel Defense Forces. Plan actions at Consumer Shows across Canada. Check HERE. Air Canada sells Sabra on board its planes. Check out CJPME resources here. Ahava cosmetics is one of Israel’s best known export companies. Find locations selling this project HERE. Action: contact Ahava stores and head office, and the Bay. SodaStream home drinks machines are one of Israel’s best known exports. Major retailers include Hudson Bay, Canadian Tire, Home Outfitters, Walmart, London Drugs and Bed, Bath and Beyond. See resources from the United Church of Canada and CJPME. The international HSBC bank is a major shareholder in companies selling weapons and military technology to Israel and also provides those companies with the loans they need to operate. HSBC Customers: Boycott HSBC, let HSBC know if you are withdrawing your services. Everyone: Head over to the War on Want website to email the head of HSBC, and tell him to end HSBC complicity in Israel’s crimes against the Palestinian people. Everyone: learn about HSBC in Canada and find locations near you. Use your own voice and creativity, along with tools to let HSBC , their customers and other know HSBC’s complicity. The Boycott, Divestment and Sanctions Committee of Palestinian Citizens of Israel (BDS48) call upon our Palestinian people in the homeland and the Diaspora, the peoples of the Arab world, and people of conscience worldwide to boycott and divest from Hyundai Heavy Industries (HHI), until it ends its involvement in Israel’s violations of our human rights, particularly in Jerusalem and the Naqab (Negev). Future purchasers: Don’t buy Hyundai products, and let Hyundai know locally along with their Canadian head office know you will not be buying Hyundai. Current Owners: Let local Hyundai know that this is your last Hyundai product if you own Hyundai. Everyone: check out Hyundai Canada Use your own voice and creativity, along with tools to let HSBC , their customers and other know Hyundai complicity. Note: several of these organizations have been on leaked UN Blacklists as well. Canada has two companies expected to be on the UN list when it is available but the names have not yet been released. We expect to provide more information on Canadian companies doing business in settlements and in support of the occupation, as well as further information on other products that have been verified by Who Profits and other groups. The global nature of today’s economy means that there are thousands of companies that have links to Israel and are complicit to various degrees in Israel’s violations of international law. However, for our movement to have real impact we need our consumer boycotts to be easy to explain, have wide appeal and the potential for success. That’s why we particularly focus globally on a select few strategic campaigns. We also encourage the principle of context sensitivity, whereby activists in any given context decide what best to target and how, in line with BDS guidelines. There is a lot of information online claiming that some large companies give money to Israel, some of which turns out to be false. BDS has built a reputation for strictly adhering to established facts and producing the most accurate information. Besides boycotting Israeli goods, what else can I do? The BDS movement is about much more than consumer boycotts: it is also about campaigning alongside others to pressure institutions, unions, and companies to boycott or divest and to isolate Israel academically, culturally, economically and militarily. Check out the other areas of this Get Involved page for more information and ideas. Will more items be added? Yes. More products and organizations will be added as research is completed, and new campaigns added through the BNC, the Canadian BDS Coalition or local organizations. What if I find a product, company or retailer that might be added to the list? Should i make direct contact with companies and/or retailers before taking an action? It is always advisable to make contact with the companies and retailers. For BNC campaigns this contact has been made at global level. For those organizations listed by Who Profits, they have been directly contacted by Who Profits. Similarly organizations like CJPME and UCC have made this contact before moving forward with campaigns. As part of publishing this list the Canadian BDS Coalition has made contact with organizations at a national level (still to be done). Best practices would be for local organizations and also individuals to also make such contact related to any boycott action or locally developed campaign. This entry was posted in BDS Coalition Actions, Campaigns, Take Action, Uncategorized and tagged boycott, economic boycott, HP on February 24, 2018 by cbcjpi. Shuhada Street, once the main economic hub in Hebron, has been almost entirely closed to Palestinians since 1994 when an American-born Israeli settler Baruch Goldstein opened fire in the Ibrahimi mosque, killing 29 Palestinians and wounding over 100 more. While Israeli settlers roam freely on the streets and carry arms, Palestinian homes and shops are welded shut. Families must pass through checkpoints to reach their homes. Roads in Hebron are divided in half, one side for Jews, and the other for Muslims. Palestinians face daily physical attacks by ideologically extreme and violent settlers and soldiers. Shuhada Street used to be the main marketplace and economic hub in Hebron. The street has remained almost entirely closed for Palestinians since the Ibrahimi Mosque massacre in 1994. Israelis and internationals are allowed to walk on the street, but not Palestinians. Palestinian families who live on the street are not allowed to use the main entrance. They are forced to use alleyways, rooftops, and back entrances to enter their homes. Around 850 illegal settlers (according to the UN, the actual number is probably much smaller) live on and nearby the street. This number is set to increase by 20%, with 31 new settlement units being approved for construction. In July 2017, settlers occupied an additional Palestinian home. They have remained there since, despite an Israeli supreme court decision to evict them. Israeli soldiers have established a post at the base of the occupied house to guard them. Israel applies two sets of laws in the West Bank: Israeli settlers live under Israeli civil law, while Palestinians are under Israeli military law. It is apartheid. 513 Palestinian shops in Hebron have been closed by military order. There are 23 permanently staffed checkpoints in Hebron within the 1 square kilometer area that surrounds Shuhada Street. Israeli forces built three new checkpoints in the summer of 2017. Streets in Hebron are divided: one side is for Jews and Christians, while the other is for Palestinians and Muslims. The economy in H2 in Hebron (where 35,000 Palestinians and 850 settlers live) is almost totally destroyed. According to a report from OCHA in 2007, eight out of ten Palestinian adults are unemployed in the old city of Hebron, and 75% are estimated to be living below the poverty line. Private donors are funding Israeli settlements through at least 50 tax-exempt organizations based in the U.S. Between 2009-2013 alone, $220 million was transferred to the settlements in the West Bank as grants by these organizations. In 2013, these organizations raised $73 million and sent $54 million in grants to the settlers and settlements in the West Bank. The organization most affecting Hebron is the Hebron Fund. In 2003, illegal settlers received 45% of their funding from the Hebron Fund. The Hebron Fund is an American organization, with 501c3 charity tax status (tax-exempt), they state that their primary goal is: the “raising of capital for the improvement of daily life for the [Jewish settler] resident of Hebron, Israel”. The finance company Goldman Sachs donated $18,000 in 2013 to the Hebron Fund. Goldman Sachs donated $6,100 in a two year period (2012-2013) to the American Friends, $708,100 to AIPAC and $15,000 to the American Jewish International Relations Institute. Be sure to follow the Canadian BDS Facebook page for more details and Twitter @bds_coaliton. Be in touch with Youth Against Settlement and Canadian BDS Coalition to share your #OpenShudhaSt actions. This entry was posted in Uncategorized on February 14, 2018 by cbcjpi. The Canadian BDS Coalition joins in sharing its gratitude to the Norwegian parliamentarian Bjørnar Moxnes with support of progressive Rødt (Red) Party for officially nominating the BDS movement for Palestinian rights for a Nobel Prize. 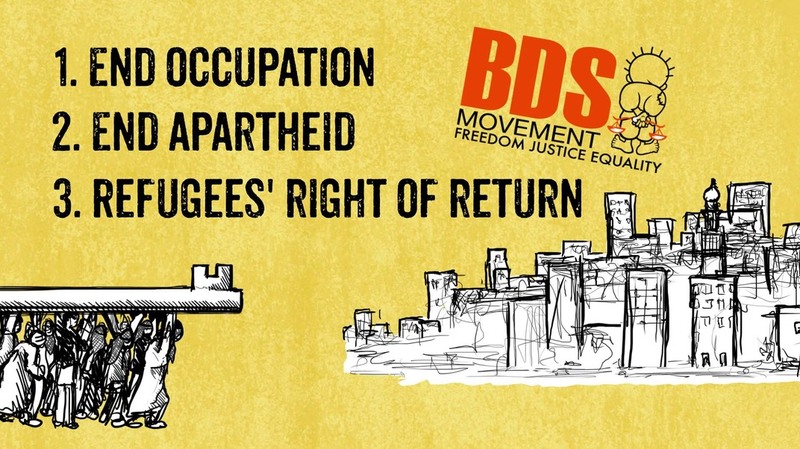 The Canadian BDS Coalition congratulates the BNC and all those who are mobilizing civil society and decision makers to say no to apartheid, and yes to justice, equity and freedom for all including Palestine. This entry was posted in News, Uncategorized and tagged Apartheid, BDS, BDS National Committee, Bjornar Moxnes, human rights, Nobel Prize, Norwegian Parliament on February 5, 2018 by cbcjpi. WHAT IN THE WORLD DOES AGA KHAN THINK IT IS DOING? This entry was posted in BDS Coalition Actions, Campaigns, News, Take Action, Uncategorized and tagged #CulturalBoycott, Aga Khan, Aga Khan Foundation, Aga Khan Museum, Amirali Alibhai, BDS, Canadian BDS Coalition, cultural boycott, Henry Kim, Israeli Consulate Toronto and Western Canada, Yemen Blues on January 18, 2018 by cbcjpi.